I can’t say I could explain what I have witnessed in Finfinnee unless I want to fool myself. The somethings I thought I have seen have turned out to the most unlikely events. For example, the millions of Oromians who flooded Finfinnee city on september 15, 2018 and the dramatic rush people made to greet the chairman of the OLF are not something my brain misinterpreted or my eyes misread. It was very difficult to keep up with everything that was taking place right in front of my eyes. It wasn’t that long ago when I felt that it is far-fetched to think that the Oromo Liberation Army would reach Oromia from its base in Afabet and Wiyah, but today the story is different. 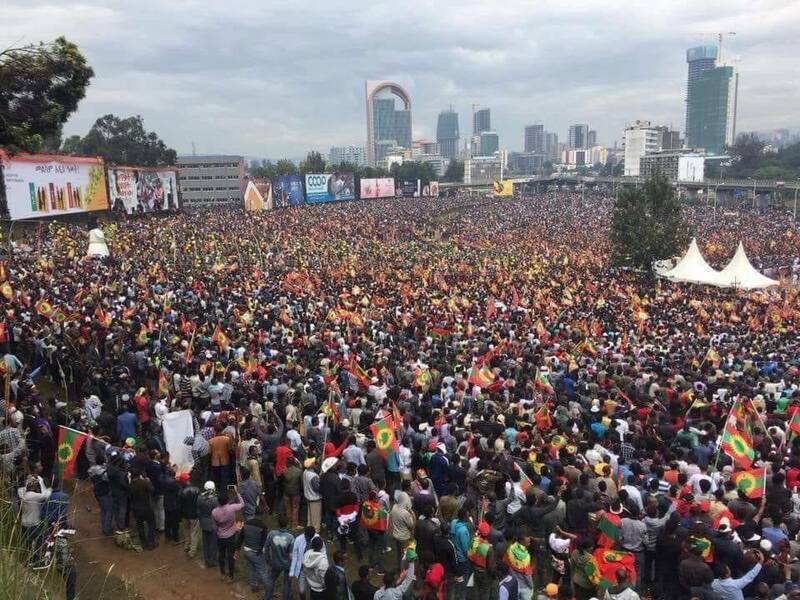 Who thought that there will be an alternative approach to political transition in empire Ethiopia? The constant shout I have heard, the fight not to be left behind chairman Dawud Ibsa’s station-wagon, the chaos that the Bole airport undergone, the struggle thousands made to be seen on a stage and secure political spot, and Masqal-Square’s choke up with 8 million Oromians feels like some sort of dream. In fact, it is these situations that made me to quickly decide to keep my distance far away from the power hungry crowed and fully allow myself to wonder about all of the possible permutations of events that cultivated the presence of those who claimed that the OLF never existed. By the time I arrived in Bole at 9am, the men who declared that the OLF was destroyed beyond repair have already occupied the comfortable sofa inside the VIP room at Bole airport and waited for chairman Dawud’s arrival. These men also made to the stage at Masqal Avenue and gave speech ahead of the chairman. Sadly though, I didn’t get a chance to listen to what they had to say because I had to walk from Bole airport to Masqal Avenue. The cars that were ready to take us all there were taken with uninvited political opportunists. Some OLF members whose spots were occupied by uninvited men were heart broken and shocked. The truth however was that no one thought something like this would ever happen. Finfinnee city was choked from four corners albeit federal forces blocking all entrees. As much as the situation felt like a dream, it was a nightmare to the Amharic speaking racists. Shocked by the situation, they distributed ammunitions to the hooligans who were also paid 5,000 Birr. The plan was to overthrow Abiyi Ahmed’s government and establish the Amhara government that would implement Minilik’s political ideology. Brihanu Naggaa’s Ginbot 7, the TPLF spying and military network supported by racist Amhara groups said to be behind the Coup d’état effort. Walking from Bole to Masqal Avenue was very difficult because the entire road and field was completely occupied by millions of people. After hours of pushing and shoving people to a side, I end up in Gotaraa, missing my way. Even then, that side of the city was occupied by afaan Oromo speaking people. On that side of the city, the Qeerroo searched anyone who tried to make to Masqal avenue and they were considerate, polite and understanding. By the time I made it to Masqal Avenue, my shoes was covered with mud, and the suit I bought for graduation back in the day has changed its identity to the natural soil color of Finfinnee. 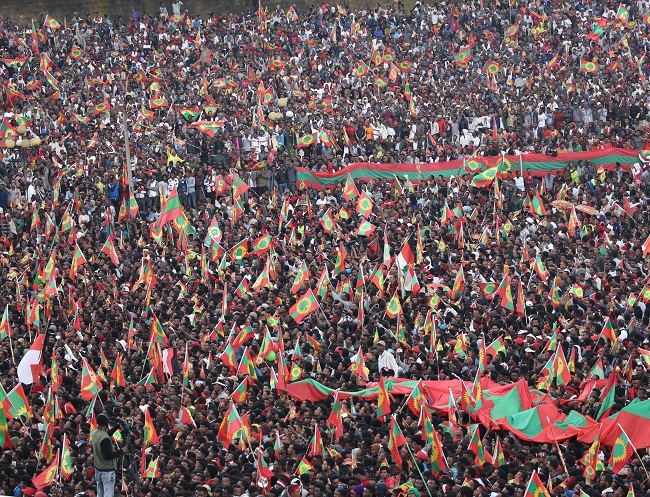 While zigzagging through the crowd, I continued to contemplate whether or not such large crowd was organized by the OLF, and that led me to conduct casual interview here and there, and most people said that they were made the OLF by TPLF/OPDO’s years of beating and abuse. After the day of celebrating the RETURN was over, I went to Ellillii hotel, a wonderful place where freedom hungry Oromians congregated All those who came and went reflected deep love for one another and all the time I have spent there had positive impact on me. People spoke to each other with inviting impression and I carry those positive words in my mind to this day. Puzzling was the shamelessness of those who declared that the OLF doesn’t exist and joined the TPLF government but now roam around pretending to be leaders of the movement. Thanks to the the Oromo mass revolt, situations have definitely skewed. At the minimum, the 3,000 years of Ethiopia’s existence and her legendary story that said she has been stretching her begging hands to the Jews God no longer valid. Give or take, the Oromians are cultivating their own civilizations that existed before the birth of Minilik’s Ethiopia and Finfinnee no longer speaks Amharic only. Although Oromummaa has not yet developed at the level of this era technology, its self-replicating probes can be felt outside of few Nafxanya strong hold areas such as former Kazanchis, Bole, Awaaree and Amiche. Old Markatoo, Piyaasaa, Adisu Gabaayaa and old Gullallee are left out to a new force that could colonize them the same way the Tigreans colonized Bole, Kazanchis, Markatoo and the entire north, south and east of Finfinnee. Generally speaking, the Oromo identity is no longer in question because it is widely spoken anywhere in Finfinnee, especially it rules in Sabataa, Burayyuu, Laaftoo and Sulultaa, not to mention west of Shaggar and the entire Maccaa region. Basically, places west of Asko are a miracle within Oromia. Because Oromummaa was ruling in these places, Ginbot 7 and the TPLF orchestrated mass killing and let hundreds of Oromians cough up large clot of blood during their last breath. Surly, racists evil deeds have left a huge historical scare behind to serve millions of Oromians as pleural embolism. The suffocating carbon-dioxide that comes out of the mufflers of the old cars made during Minilik era almost chocked life out of me. Air Pollution, drinking Water inaccessibility, the Garbage that was disposed everywhere, the deafening noise and the rudeness of the taxi drivers and Wayaalas brought back all the memories I have had while living in Mesalemiya/Ihil Brenda when I was a middle grade age boy. All the green open places and Parks designated for public use during the Derg time is occupied by Tigreans sky scrapers and kids and animals are exposed to car accidents and high pollution levels burned my eyes and affected my throats. The complex mixture of solid and liquid particles suspended into Qabana’aa river originated somewhere under Inxooxxoo hill and run near Kenya Embassy down the Ambassador theater released massive stench and filthy odor into the atmosphere and the smell of coal/kasal, gasoline, diesel fuels and wood that are burned in every household produced chemical reactions of nitrogen oxides and organic compounds that occurred in the environment. No vegetation or grass can be seen but dying donkeys and few cows can be seen lied on a hot asphalt or stood near the roads hanging their broken legs in the air. Exposure to these toxins are visible in the persistent cough, sore throat, burning eyes and chest tightness I felt during my stay in Finfinnee. In fact, I was worried that it may turn into asthma. Although Finfinnee is dusty, dirty, unhealthy and crowded, its shanty homes still stand behind the Tigreans sky scrapers constructed all along the main roads. For any observing eye, these tall buildings owned by the Tigreans cast light upon the the 28 years Tigreans colonization history of Finfinnee as well as on the strengths of the Oromians who live in it. What is particularly inspiring about new Finfinnee is that the Oromians speak their language without feeling fear of stigma. Of course, it is painful to miss the empty spaces I played soccer on, and the friends and the neighborhoods I knew growing up. The original image of Kazanchis, Awaree and Bole have been replaced and the cool breeze of Finfinnee through which our soccer team trainer obbo Abdub Daljessaa made us run is replaced by toxic air that clogged my throat. Traveling to Gullallee actually broke my heart and I was depressed. The asphalt road upon which I chased number 19 Anbassa bus is full of potholes and the unrestrained population growth has choked the entire street and alleyways.